Big fish eat big flies, right? These innovative patterns aim to catch the largest fish in the river. Like many who dream about being on the water rather than at work, I sometimes visit the internet to scratch the itch. Videos of exotic expeditions, expert tips for every angling problem, and the latest fly patterns are all at our fingertips. Yet, in an age of content for content’s sake, you quickly realize this stuff is sometimes repetitive. Fly tying especially falls into this trap. 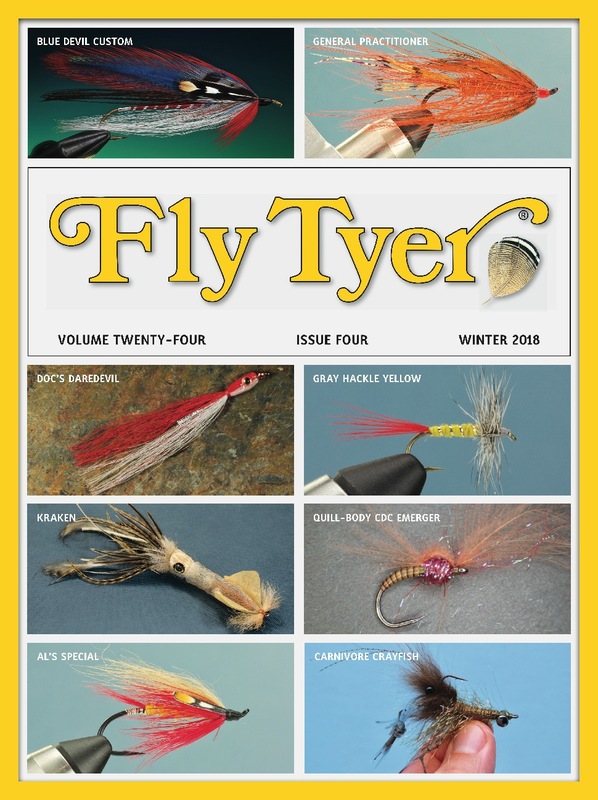 The truth is that fly tying often becomes variations on the same thing: a basic principle with a new twist, a material substitution, or a slight variation in technique. There are, after all, only so many ways to attach materials to a hook—or so we think. Recently, while looking through the usual fly tying blogs, I came across a photograph of an immense rat fly unlike anything I’d ever seen. I took the bait, clicked the link, and found videos showing both how the fly looked and swam. A guy named Steve Yewchuck created this crazy pattern. I kept digging and found more of his monstrous creations: bats with articulated wings, sputtering foam ducklings, squids with undulating fins, lizards that kick and wobble, lifelike cicadas with perfect profiles, and forearm-length muskrats that swim like the real thing. These flies aren’t your standard fly shop fare, and they’re certainly not for the faint of heart. 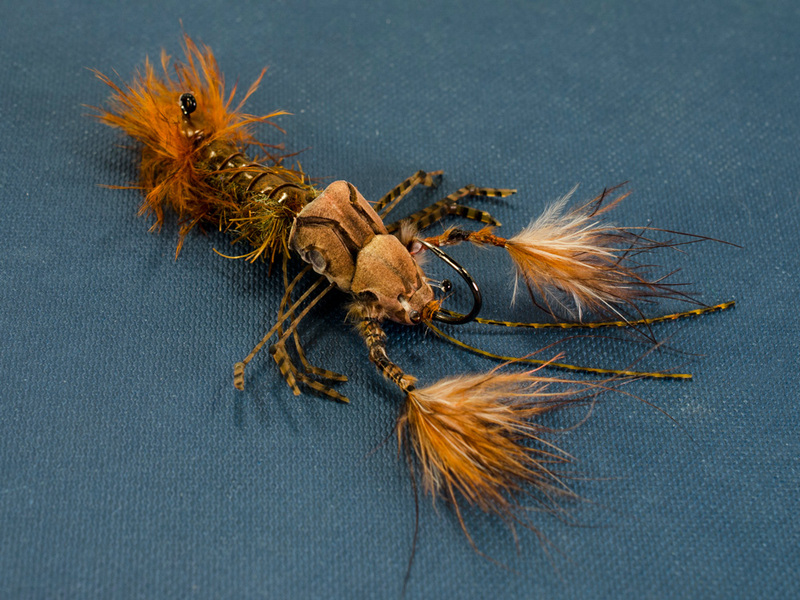 Using his gonzo style of tying, Steve Yewchuck creates patterns that push the boundaries of modern fly design. Yewchuck has the mind of an engineer and the soul of an artist. Looking at his past, it’s easy to see where they come from. He grew up in Narrowsburg, New York, and as a kid, he fished for smallmouth bass and walleyes. The trout in the Delaware River, however, spurred his love for fly fishing and tying. He went to college for art and photography, but after graduation took a job as a high-end machinist. 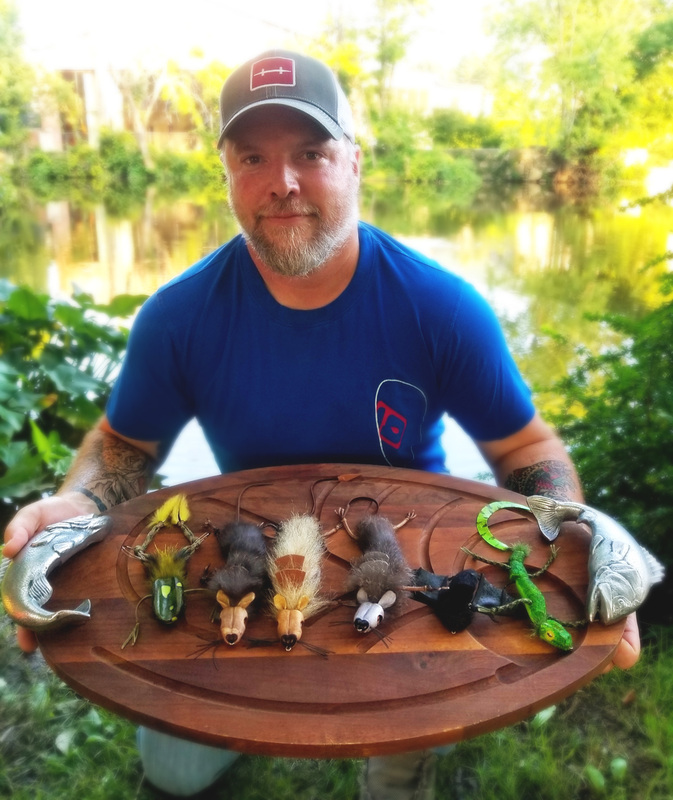 He now rebuilds airplanes for Reese Aircraft, a career that allows him to pursue fishing, guiding, and filling fly orders for his company, Envision Fly Works. Yewchuck applies the same intense precision required in airplane restoration to his tying. When I first encountered his work, I noticed a reoccurring checkerboard background in every photo. When I asked him about it, he said he uses the mat to constantly check the sizes and profiles of his flies. This attention to detail leads to repeatability. Each of Yewchuck’s flies is identical to the next, a mark of a true craftsman. This precision ensures every fly casts and swims the same. This assembly-line production method is the outcome of arduous design and testing. Abdomen: 30-millimeter-long custom jig shank. Shell: Wapsi Thin Skin or Kiley’s Exo Skin. Hook: Allen SW004, size 2/0. Body: Two Flymen Fishing Company Double Barrel Popper Heads, sizes small and extra small, glued together and colored with permanent marker. Legs: Hareline Magnum Predator Legs. Antennae: Hairline Buggy Nymph Legs. Claws: Marabou plumes wrapped with gel-spun thread. Part of Yewchuck’s ability to innovate lies in his vast knowledge of materials that extends beyond fly tying catalogs and fly shop shelves. Once Yewchuck has worked through a pattern on paper and in the vise, it’s time for testing. Stinger hook: Partridge Nordic Tube Single, size 8. Tail: 2½-inch-long piece of coreless paracord with braided backing run through the center, and a small foam tail. Rear hook: Allen SW004, size 2/0. 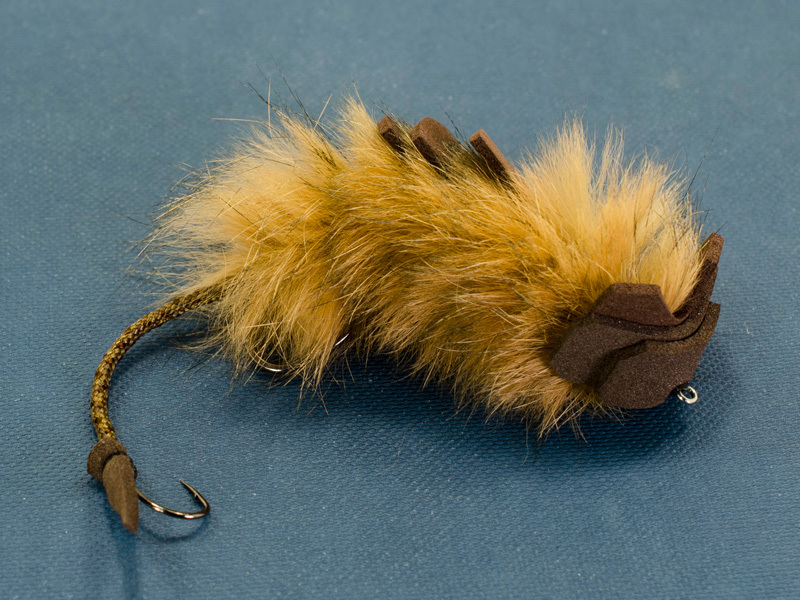 Body: Montana Fly Company 35-millimeter offset shank and Montana Fly Company Bunny Brush. Body shields: Three 2-millimeter-thick pieces of shaped foam. Head: Montana Fly Company 15-millimeter offset shank and a Montana Fly Company Bunny Brush. Ears and face: 2-millimeter-thick foam. Steve Yewchuck’s Ring Leader Rat is what initially got my attention, but I soon discovered it was only one fly in a series of rodent-inspired creations.